If you are on the market for a blender you will have likely heard of both products the magic bullet and the Nutri Ninja sometimes just referred to as the ninja. Both options are undoubtedly popular and generally well liked amongst consumers. But which is the better option between the 2 and which is more suited to your needs? Below I will cover both blenders for a brief overview then I will do a direct comparison between them, so you can choose the best option for your own needs. 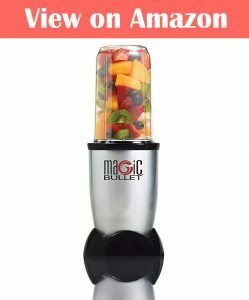 The magic bullet is a blender that has 250 watts of power and comes with a maximum blender capacity of 16oz. It also comes with a 11-piece set including 1 cup and 2 mugs. It is a branded as a high-speed blender and while not the highest out there is does a good job regardless. The design of this blender is quite good though it is starting to look a little dated with its slightly older design. As far as blending goes with this blender – it truly blends really well and the blended puree that comes out after is smooth and consistent with no bits or lumps in sight. The Ninja is a blender that has 900 watts of power and comes with a maximum blender capacity of 24 oz. It comes with an 18 oz cup and also a 24 oz cup. As you might have imagined this blender is really powerful and it really blends everything very effectively and quickly. When compared with the Magic bullet the output blend is definitely smoother. As for the design it looks really modern and classy and should easily fit well inside any kitchen. As I already sort of mentioned I personally prefer the design of the Ninja, it looks more modern and up to the times whereas with the Magic bullet it looks a little dated but still has a solid design. Though in terms of design alone I would choose the Ninja. The Ninja is comfortable number 1 in terms of performance. The ninja has a lot more blending power and it does blend quite a lot faster than the magic bullet. In terms of the end result the Ninja has a slightly smoother output though the Magic Bullet is still good though it takes a little longer to blend completely. The build quality in both of them is quite solid but for me the Ninja is better. It feels sturdier and well-made than the Magic bullet. The magic bullet has a cheaper build overall. The price is quite comparable between the 2. I would say both are worth the price they are offering though if the price is similar between them both I would easily recommend you go the Ninja because it basically has the edge in all the important categories. Both blenders are well made, and both create a smooth and consistent output. Though it must be noted that The Nutri Ninja has the edge in basically all of the important areas as I have mentioned above. If you can get the Magic bullet for cheaper than the Ninja then it would be easily worth buying though if both options are around the same price point it is an easy choice to choose the Nutri Ninja.